In our last blog post about Trailer Sway Control we talked about the two types of systems and how they work to reduce sway caused by a number of different factors including crosswinds and traffic - you can catch up on that post here. Today we’re going to talk about the components that make up these two systems, optional pieces of equipment and some common used terms and descriptions. The Dual Cam Sway Control has three main components consisting of the cams, brackets and chains. The high performance unit has brackets that mount to the trailer frame which makes for an easy hook up and less chance for interference with other equipment on the front of the trailer. 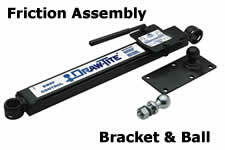 The Friction Sway Control also has three main components including the friction assembly, mounting bracket and the ball. Only one friction brake is used and can be mounted to either the left or right side of the trailer. We’ve got a big selection of models to choose from that will fit any price range. The Weld-On Sway Control Adapter is a straight bracket to attach friction sway controls to the weight distributing hitch. The Replacement Sway Control Ball fits most brands of friction sway control. The Dual Cam system comes as a kit that includes everything you’ll need but it’s a good idea to have an extra set of replacement U-bolts on hand. Dual Cam Arm: The cam system uses a return-to-straight force damping mechanism that depends on spring bar loading. When matched to the hitch weight this system gives improved handling and controls sway before it happens rather than reacting to it after it occurs. Main Body Assembly: This is the area of the friction sway control system that houses the actual sway controls. Sway: Trailer sway can be caused by a number of factors including passing traffic, sudden changes in direction or swerving and crosswinds. Improper loading, tire inflation and incorrect weight distribution can also influence sway. Slide Bar: This is the adjustment area of the friction sway control. This will give you more background on your options when looking at Trailer Sway Control and what will best fit your needs. These systems will definitely help by giving the driver better control in a variety of road and weather situations. Remember that these systems are for class 3 & 4 hitches and should not be used with surge brakes or on Class 1 or 2 hitches. Still have some questions? Give us a call. 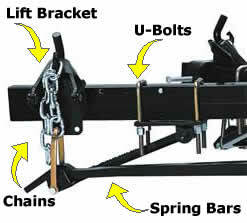 We can answer any questions related to Trailer Sway Control. We’re here all day at 877-509-0719.